The sounds of chain saws were heard around storm-struck areas in Henderson County and neighboring Warren, after Thursday's damaging mid-day windstorm. Homeowners, friends, neighbors, and city crews were busy cutting up the mess left from downed trees, dragging the limbs into large piles along the road, or hauling them away, or pushing them into one big brush pile to deal with later. Over the noon hour, a thunderstorm with strong winds seemed to have dropped down and attacked Oakwoods Estates, and a barn at the south edge of Bluffdale, small housing developments off Highway 34 between Gladstone and Gulfport. And in a flash, the strong windstorm was gone not lasting over a couple minutes, most said, and moving along and over the bluffs ripping up trees as it moved south of the Kurt McChesney home. The wind continued and ripped through Dutch Row, tearing off roofs, toppling grain bins, flattening corn and never looking back at the destruction it left. Weather officials reported it was not a twister, not a tornado, but 65 mph up to 110 mph "straight-line" winds. At the school, Peg Ingles said kids were watching leaves plaster windows and the weather report was showing the storm traveling along US 34. It traveled on past Biggsville where it continued damaging whatever was in its path. Around the Warren-Henderson County line on US 34 the corn damage became more visible and wider-spread and had its eye on Kirkwood where it plowed down fields in its path to the small village of 200. 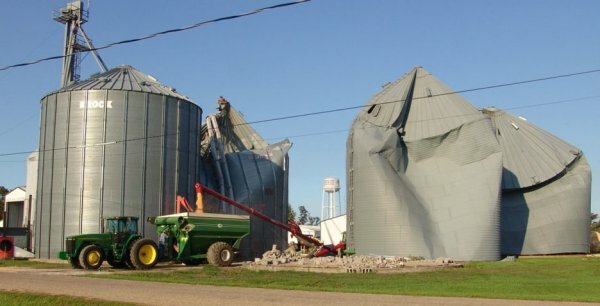 It entered about 12:45 p.m., luckily while those working on harvest equipment were at lunch and many out of town, first crashing into Beulah Land Grain, (a 4,000 bushel grain bin facility of the Defenbaugh families, tearing up a township hall, and damaging trees, rooftops and equipment in yards. Defenbaugh said that it was good that Tim McVey had gone to lunch for the grain bin landed what on top the equipment he had been on. Defenbaugh said that usually six or seven of them would have been getting ready for harvest and changing augers, but they all happened to be gone that day. Defenbaugh was out of town with his two sons and a grandson when his wife Alice, called him with the news, and he headed for Kirkwood. All but 40 acres of his crop was lost and all his grain bins damaged. A TV reporter said to him, you must feel pretty bad, losing everything. "I don't feel bad in the least. Nobody was hurt or injured. You can't feel good, but you can be thankful. You can plant more crops, and you can build more bins, but you can't replace a life." Defenbaugh said they had just buried a stillborn grandchild, and felt that loss more deeply. Almost everyone in the community were dealing with wind damage and downed trees. He said that John Dew's wife was on her way with lunch for her husband who had a large mechanic garage just west of his elevator when she was stopped by a train. She said the train was tilting and she thought it was coming over on her. Luckily, it didn't. Others throughout the area heard reports of semi's blown over, and sports cars lifting, and an engineer returned home to say it was his first experience of being tilted in a train. 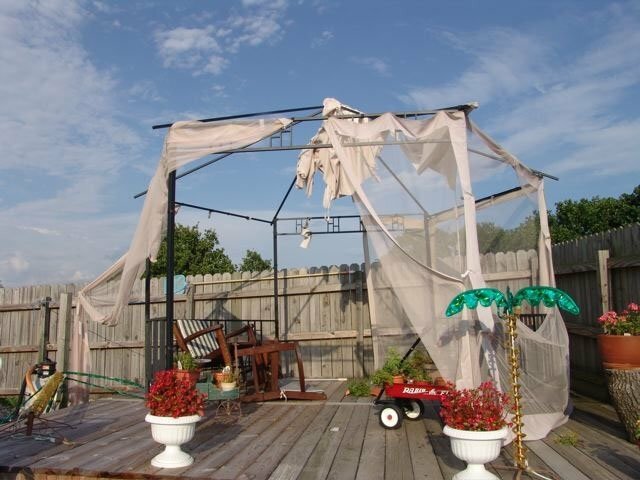 Ron Bowlyow's Gazebo area by his pool, disarranged. 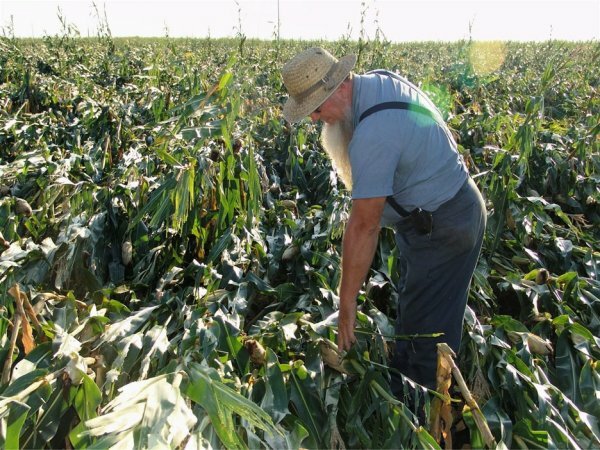 Ray Defenbaugh checks his cornfield which just last week was taller than him. Beulah Land Grain owned by the Defenbaugh families were completely destroyed. Workers are removing what little grain was left so bins can be removed and replaced.